Understanding argon diffusion mechanisms and their kinetics is one of the most important issues in 40Ar/39Ar geochronology because many of the applications of 40Ar/39Ar geochronological technique are developed on the basis of well constrained diffusion rate of argon in minerals. 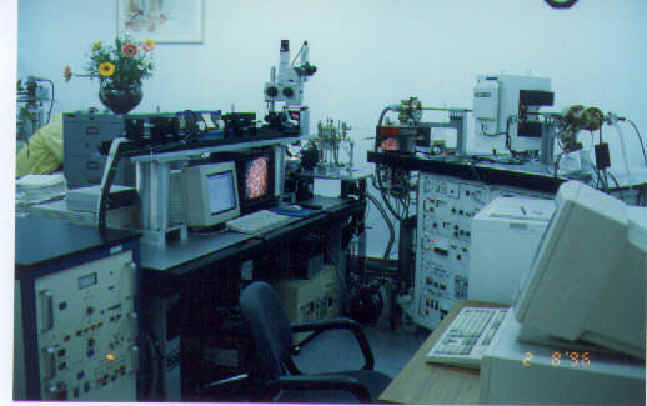 Fortunately, the sensitivity and resolution of the analytical instrumentations in the laboratory (laser dating probe and furnace step-heating technique) allow us to examine these fundamental problems in 40Ar/39Ar geochronology. Based on field and experimental data, several projects regarding argon diffusion in K-feldspar, micas and hornblende, are currently conducted in the laboratory. Lo, C.H. and Onstott, T.C. (1989) 39Ar recoil artifacts in chloritized biotite. Geochim. Cosmochim. Acta 53, 2697-2711. Lo, C.H., Onstott, T.C., Chen, C.H. and Lee, T.(1994) An assessment of 40Ar/39Ar dating for the whole-rock volcanic samples from the Luzon Arc near Taiwan. Chem. Geol. (Isot. Geosci. Sect. ), 114, 157-178. Lo, C.H. and Onstott, T.C. (1995) Rejuvenation of K-Ar isotope systems for minerals in the Taiwan Mountain Belt. Earth Planet. Sci. Lett. 131, 71-98. Lo, C.H., Lee, J.K.W. and Onstott, T.C. (2000) Argon Release Mechanisms of Biotite in vacuo and the role of short-circuit diffusion and recoil. Chemical Geology 165, 135-166. Wang F., Zhu, R., Yang, L., He, H. and Lo, C.-H. (2008) 40Ar/39Ar analyses on Quaternary K-Ar standard BB-24: Evaluations. International Journal of Mass Spectrometry 270, 16-22. Wang, F., Jourdan, F., Lo, C.-H., Nomade, S., Guillou, H., Zhu, R., Yang, L., Shi, W., Feng, H., W., Wu, L. and Sang, H. (2014) YBCs sanidine: a new standard for 40Ar/39Ar dating. Chemical Geology 388, 87-97. Wang, Y., Zwingmann, H., Zhou, L., Lo, C.-H., Viola, G. and Hao, J. (2016) Direct dating of folding episodes by 40Ar/39Ar analysis of synkinematic muscovite on flexural slip planes. Journal of Structural Geology 83, 46-59. Chen, C.-T., Chan, Y.-C., Lo, C.-H. and Lu, C.-Y. (2016) Growth of mica porphyroblasts under low-grade metamorphism - a Taiwanese case using in-situ 40Ar/39Ar laser microprobe dating. Journal of Structural Geology 92, 1-11.